The Pirate/ Slaver group camp and safe zone has been moved from the Docks to far NE corner of the sim behind the slaves Head Inn. This can be got to by walking through what used to be the slaver safe zone, the store rooms, and out through the caves at the back, just keep following the sand path. If that seems like a long walk through the sand, especially for those of you with Peg legs, then there is a rowing boat down the Dock wall steps near the Slaves Head Inn which will TP you straight there and back. The cages in the Dock are no longer just for the use of slavers, but the ones in the slavers new camp are. Why move? well we have over the months had many requests to bring back the slavers tents, and to be honest the group have not really had a settled home, well now they have. three cheers for the return of the smelly seal skin tents and the good old camp fire. I can already hear the good old she shatiesringing out over the sim, ahh Jim Lad, it be awesome. The Device is available at the Metropol Store – reserved to Metropol, Rep-Detec and MetroMech. It costs 1L$. 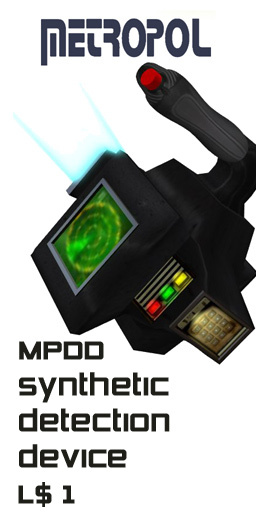 Scripted to detect synthetic. 4. Click on the device to turn it on. 5. It will bleep normaly for a short time and then you will recieve a readout of the result of the scan in the bottom left of your screen. Scan result -Unknown organism: Scrambled signal. You must click the device again to turn it off or to re scan the suspect. A new minor release is out. There is 1 bugfix and one modification needed for the upcoming cargo mission at nomos. Upgrades are available for free at the game room at the entrance of the SIM. Look for a sign on the wall for HUD Upgrades. Our New Forums are now open. We hope many of you will register and make use of what could be a great tool for the promotion of game play, role play and community, all it takes is input from you. If you are unable to use a weapon to fight against rats (e.g. you are a prisoner), you can now use the crowbar (at Nomos) or the hammer (at KOS) to defend yourself. We have come to know that many unscrupolous business owners are now using dead rats to increase their pantry and sell more food and drinks during the day. Apparently rats are wandering the city of Ireem. And some rat hunters chase and kill them, then they sell the dead bodies to business owners. Make sure to eat quality food. Beware of the rat business. All of them have some RP requirements, including some group restrictions. ALTs are not allowed to bid on it. Please have a genuine interest in the role.